I am working on a project called Park Here as a part of the Open for Business exhibit at the ASU Art Musuem. The project is a survey project in collaboration with the DTC, Tempe. 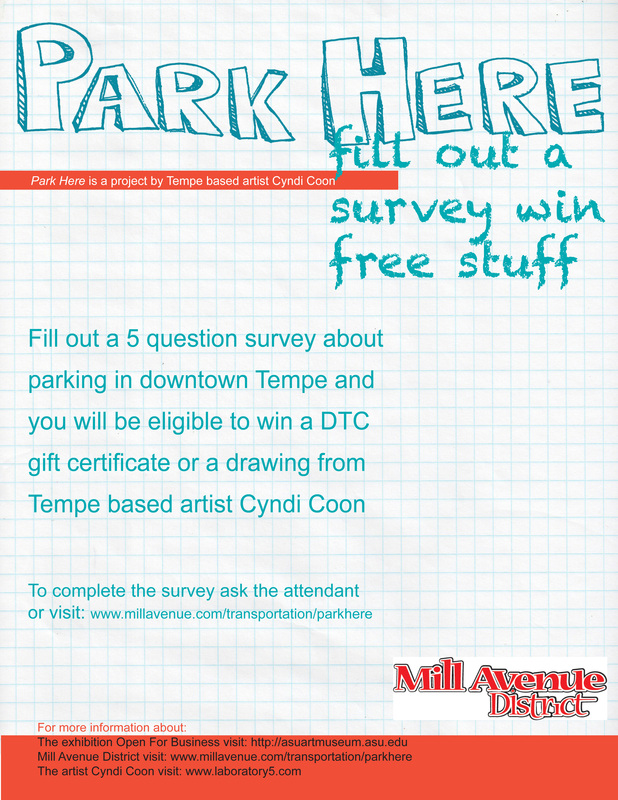 The parking garages will have signage alerting visitors that there is an online survey that participants can fill out and by doing so they’ll have the opportunity to win gift certificates to downtown Tempe businesses and to win a drawing from by me, from the project. Each week DTC will select two survey winners to receive these prizes. For the artistic component of this piece I will review the survey data weekly and create drawings based on the weekly answers. These drawings will be placed in the ASU Art Museum weekly, during the run of the exhibition. The drawings will all be given away to the winners at the close of the show in January. I have created this project to encourage conversation between Tempe businesses, community artists and ASU and I am excited to read the weekly results as inspiration for drawings. Click to participate in the online survey. You might win something! What do the ASU Art Museum, Tempe Chamber of Commerce, Tempe Convention and Visitors Bureau, Downtown Tempe Community (DTC), Local First Arizona, Create Connect, *Scottsdale Public Art and Volunteer Legal Assistance for Artists (VLAA) have in common? They engage, educate, raise awareness and connect communities. In a collaborative effort to create increased understanding and dialogue about local community, these organizations will join forces with local business owners and artists for Open for Business, an exhibition which will take place jointly at businesses of downtown Tempe and an interrelated exhibition in galleries of the ASU Art Museum. The exhibition will involve sixteen Arizona artists exploring, and allowing the audience to explore, businesses of the Tempe community with onsite installations and projects. The work created for the exhibition will address the purpose of each business, challenging the audience to interact with the physical space and purpose of each business. Guide maps to the locations will be produced and available throughout downtown Tempe, Scottsdale and the ASU Art Museum. The projects intention is to connect local contemporary artists with local businesses in hopes of a mutually beneficial art/business related outcome. The projects will be respectful, relevant and engaged with the actual purpose of that individual business. The projects may have fun with the business and/or its customer, but will not make fun of that business and/or its customer. This entry was posted in community, creative, inspiration and tagged creative, Design, local, Phoenix. Bookmark the permalink.